Ian Thompson led worship today with Mark, Amanda, Jonny and ian Taylor. It was the second of our joint services with Headland Baptist Church. It’s a pretty amazing experience when we all come together to worship. It was also a chance to sing happy birthday to Jonny as he celebrated his 18th through the week. 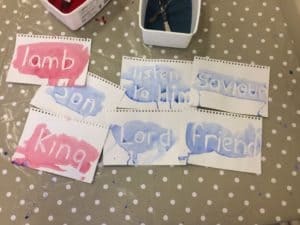 T im brought us the Word today, He got a lot of the kids to take part in a painting activity transforming plain pieces of paper into different names for Jesus simply by painting over the paper with a wash of paint. Tim assured parents that the paint would wash off so let’s hope he’s right. Tim pointed out that the music has a definite rock influence this morning. Nothing wrong with also wanting to join in with what the kids are doing next door in our quiet bits, particularly the Father Abraham song . Tim read to us from Luke 9 verse 28 onwards, the story of the transfiguration. He asked if anyone had been up Roseberry Topping. Anyone heard a voice from heaven whilst they are up there in the clouds, It does not happen very often. Jesus had just shared eight days before that his path would lead to death and the cross. So what had Peter and the other disciples being doing in the eight days, they were probably frightened and confused. Here they were now on the mountain top having this experience. A lot of people are looking for that mountain top. But many of us don’t have this dramatic experience, Tim asked if any of us had been stood in a cloud on a mountain hearing the voice of God. No one out their hand up. Many of us live at the bottom of the mountain. Tim let slip that he is a big Elbow fan and that this transfiguration sunday always reminds him of their song lyric,” One a day this like a year’d see me right!” (For those who don’t know who Elbow are they are a Manchester band) Point of the story is that Luke is telling us who Jesus really is, letting the disciples have this glimpse before the road to Calvary. Why were they sleepy ? Is this more about them not being aware and then having something revealed to them. Maybe this shows Jesus as quiet in prayer. The disciples do the same at Gethsemane . There though, the humanity of Christ was revealed to them. On both occasions they are awoken to the true nature of Jesus. Jesus is seen here between the two pillars of the Jewish faith, Moses and Elijah, with them giving a glimpse of the resurrection story. Peter was a practical guy and his strange desire or response was to build some tents. He didn’t know what he was saying. He was maybe trying to preserve the moment. The Jewish expectation for the Messiah was a start of the new age at the festival of booths. Maybe this is why Peter feels he needs to build the tents or booths, Peter assumes the deal is done, that this is the end point. Suffering and death and a cross on a Hill was not on the agenda. Death and resurrection is something they cannot get their heads around . They had not remembered that Jesus has already said that he had not come to abolish the law but to fulfil it. Jesus is the Christ he is the Messiah , the incarnate Son of God. He chose to show up as one of us and follow the path to the Cross simply because he loved the people he had created. It’s a simple story that is there to reassure people that the events described are to be trusted as a beacon of hope. We’re given a glimpse of who Jesus really is as we live our lives. Wherever we go he journeys with us , in darkness or on the mountain top. He’s the only one we need to listen to. Listen to Him, listen to Him. Love your enemies! It really annoys them if you do. Ian led worship on 24 February, supported by Mark and Amanda. Yvette brought us the Word today from Luke 6 27:38 . She continues to maintain that connection with her mum as she uses he r mum’s well worn battered, bookmarked bible to preach from. 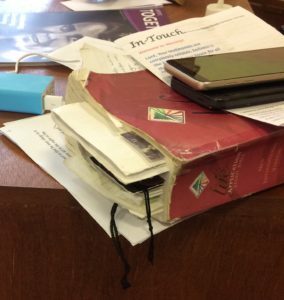 It might need some sticky tape every now and then, but a battered well used bible filled with bookmarks and used by successive generations is its own silent testimony! God’s good isn’t he, this time last week Yvette was stuck on the hard shoulder of a motorway with a broken bonnet and windscreen. Thankfully a new bonnet was found and the dartford crossing was not a problem when friends went to get the new part. Luke was a doctor and a man of evidence. Luke gives specific instances of reference to women. Luke’s version of the sermon in the mount with four disciples but then talks to those who will listen. People had been hoping for a military messiah and what they got instead was a message of forgiveness, note how God often tells us exactly the opposite we want to hear!! Why does Jesus tell us to love our enemies. Well it really annoys them, people are more likely to take our side and most importantly it’s what he did for us. Jesus got blamed for things he didn’t do, was denied and yet never gives up on us. He never treats us as what we actually deserve . Jesus is asking us to be different, exposing evil in a way that brings change. The Roman soldiers were mostly right handed. They would slap you on the cheek so turning the other cheek actually means you force him to treat you as an equal. Jesus is talking to the debt ridden poor, people often sued unfairly. The person who takes everything you have is the one who looks bad here. Using the examples he does, Jesus shows how the system is corrupt and how we can change it. Breaking the cycle of insult and violence is what’s matters. But we can often be slow to be kind to ourselves. Yvette,s husband made mistake with the car bonnet and he’s still beating himself up about it. Yet everyone else sees it as a simple mistake and nothing he needs to be worried about. We’ve all done things to others or simply got things wrong . Thankfully God accepts us just as we are. Think what we get back if we treat people well, if we love and we do not judge. As Christians we have a reputation for judgement at times. Mother Teresa said “The good you do today, people often forget tomorrow. Do good anyway. Give the world the best you have and it may never be enough. Give the world the best you’ve got anyway. Service interrupted was the title I had for my blog of 10 February. It was more apt than I realised as I ended up missing a couple of services due to a cold. My original service interrupted was simply because I started to record what Tim was preaching on and then ended up having to leave the service to help deal with the challenges posed by some young people from the estate who were playing up. My blog was split therefore between a little of what Tim was preaching on and then what Richard Hetherington preached on later that day at the Gathering of the Baptist churches at Oxford Road. We are ressurrectipnists we do Easter every day. So it’s ok to have crème eggs every day Tim says. Do we need reminding about the gospel? How would we describe it? All too often it is turned into some sort of ticket for heaven. Believe what I believe and you we go to heaven. Is that really what Paul is saying here. ? Does this mean some go to heaven and some to hell . The theme here is of resurrection and the Corinthians were having problems here. .. They had lost the plot about what the gospel really is. They need to live according to the scriptures. They need to see the whole story. They need to understand Jesus the raised Messiah. Remember they did not have the New Testament ! Paul uses the Old Testament to point the way. Jesus his shameful death his burial and his resurrection. That’s the message in a nutshell. On that first Easter Day he appears to all sorts of people.” And that was all I got to hear thanks to having to deal with the young people outside the church. Fast forward to the Gathering and my second attempt to reflect the preaching I heard. Richard outlines two points,one of encouragement and one of challenge. The encouragement is the place that it happens. Can we remember the first time we heard this message. “Who do people say I am?” Peter’s reply can be added to with many other names. Caesarea Philippi was a renamed town and it was a way of saying the town was dedicated to Caesar with all the emblems of imperial power. 14 temples and shrines to all sorts of foreign gods. It was full of all the new things. And there was a mountain with a gorge with a tributary of the Jordan called the Gates of Hell. Yet Jesus took them there to ask the question. And the disciples got it. The word of encouragement is this, the community we live in is uninterested, following odd ideas of spirituality. Never be tricked into believing that the gospel message you share does not have power with some else. What you share may change someone else’s life. Here’s the challenge when people come for baptism Richard always tells them the same story. Whatever has brought them to that point , they shouldn’t ever think that that was all there was. At the point of committing yourself, that’s the start of the challenge. Will you surrender this, if it works out it is from me, if not move on. Richard also reflected on some of the things he struggled with. His wife came from a background where tithing teaching was familiar and routine to her. For Richard this was yet more to learn. We all at some point ask Jesus to be Lord of our Lives. Is he still Lord of our Lives? Amanda, Ian, Jonny and Mark provided our music for worship today. Amanda led worship with some work with the kids and adults on being part of a team and in turn part of one body. Jonny provided the expert football advice reinforced by Josh whilst our body illustration was provided by Jess. Amanda encouraged us all to come and enter the things we do on the diagram that symbolised the body of the church. She took us through all the different roles and asked us to remember not to say “we are just the…” when describing our role. We’re all a key part of the body of the church. 1 Corinthians 12:12-31 was the passage preached on by Tim. Paul has used the picture of a body . But imagine an eye with just two legs running around. Imagine an ear just flying off on its own. The church in Corinth was in a mess, full of factions all intent on following different people or ideas. Spiritual gifts were being shown but they were not being used in the right way , not for the common good as Esther showed last week. We often look at the gifts and and what applies to us and this is not helpful at all . Just ticking off a list and aspiring to other gifts. This means we’re focussed on the I and not the we. It blinds us to what others are to us. Paul urged unity, to see it is about us, about us being a part of the incredible thing that God calls the church. There were those in Corinth who spoke in tongues who were queuing up to perform. Without interpreters this was just babble. There are several different lists of spiritual gifts. Spiritual gifts were granted in Exodus to decorate the temple. God equips his church for every moment in history. There are gifts now that did not exist in the Bible, such as doing the computers at the back of church. Each of us is a unique gift to the other. The churches are all different. We’re walking along a path with our brothers and sisters from Headland Baptist Church. It may be uncomfortable. What about the other churches Holy Trinity, St. John Vianneys, the Pentecostal church. They are our partners in Christ, without these unique gifts from God we are not complete. The church is intended to be a first taste of all creation. It is difficult to work with people who are different to us. It’s a gift from God, his grace at work through difference and diversity. Paul’s claims in 12 and 13 are rooted in baptism. Baptism lets us experience the spirit of God at work. The Corinthians were using gifts for their own glory and not for what got intended . Paul writes to the people urging them to be part of one body. This image was used in the Roman world but they made it that the privileged did not have to do anything. Paul turns this around saying that the weak parts are there to be cared for and not abused. Tim was stuck on the image of an eye just running around on two legs! Paul points out the absurdity of parading gifts without love. Paul deliberately focussed on the weaker parts having a special place in the body picture that Paul is describing. Those cultural weaknesses characterise his own weaknesses. The weakness of |God is stronger than human strength. God’s power is at work in what the world sees as weakness. Paul reinforces this in his second letter. God has arranged the body giving greater importance to the weaker elements. A well functioning Christian community should release the gifts of others. The gift of each is inseparable from the need of each. It is easier to reach out and embrace our Baptist brothers and sisters at headland. Yet we’re not so comfortable reaching out to our Anglican or Catholic brothers and sisters. Yet god made all this diversity. Paul reminds of the need for unity, paul needs to bring the letter to a close and in verse 27 he does this. In the Greek translation this starts “You” imagine Yoda saying “You, the body of Christ are!” This is a plural you in the Greek . Each one us is part of it. Whatever strengthens the community is to be sought out and welcomed. We are his body, let us live up to that calling. 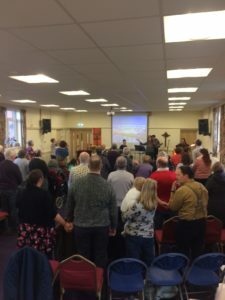 On Saturday 26 January, Headland and West View Baptist Churches came together in a launch event to mark the start of what we all hope will be a shared journey for both churches. We believe that we are already two active churches in our local communities but together we can build and complement what is going on in each church. We held a launch event at West View Baptist Church with a worship band drawn from the musicians and worship leaders from each church. 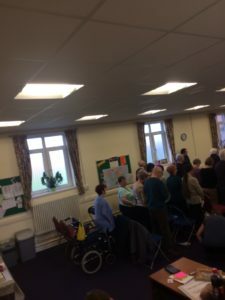 We all brought food and shared information about the work that each church has been doing in the community, our house groups and prayer meetings, and some facts and a quiz that aimed to find out more about the people in each church. We hope that we have made a good start. Our plan is for us to have a joint service on the first Sunday in each month. So on 3 February, there will be no service at West View Baptist Church as we will all be going to the Headland Baptist Church for our first joint service. The following month Headland will come to us and so on. This is an exciting journey together. 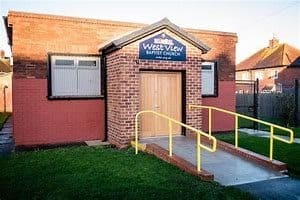 West View Baptist Church was established by people from Headland Baptist Church so this is the next leg in a journey that started in 1843, launched West View in 1956 and now heads off in a new direction. 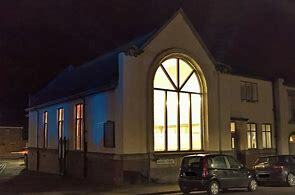 If you would like to know more about our church or about the Christian faith feel free to get in touch.